schedules, etc. and piece together all the things we enjoyed and change the things that didn’t ever quite work and we were able to have a smooth, fun, and rewarding trip. to…” and I started to cry. I cried tears of joy because this team who had no idea what they were getting in to and who I thought would mostly be “one-timers” all want to come back. Every one of them! My prayers were answered. I prayed that our team would feel true love for their brothers and sisters here in Guatemala and take home a new appreciation for the blessings we all have. My prayers were answered and so much more! We also already have a “waiting list” of other people who want to join our team in the future! hygiene kits, etc, along with some donations. I thought, there is no way we will be able to fill 24 bags and even come close to matching what the other team has always brought. However, miracle upon miracle has happened over the past year and we have had more donations than we ever dreamed possible! We had donations from friends and family, both local and long distance. We have also had donations from complete strangers who we still have never me. One woman from Idaho Falls, ID, found our facebook page and contacted me. She has adopted three children from Guatemala and wondered if her daughter could make dolls to donate and send with us! So her daughter made 20 dolls and she mailed them to us! A friend of mine who lives in Washington was talking to her chiropractor’s wife during one of her appointments and her chiropractor’s wife sent us about 50 crocheted hats! We were able to fill 23 bags of donations! 406 hygiene kits (ziploc bag with 2 washcloths, bar of soap, 2 combs, tube of toothpaste, and four toothbrushes), 323 single toothbrushes, 223 adult blankets, 95 baby blankets and quilts, 403 knit or fleece hats from infant to adult sizes, 1,070 toys for children including handmade dolls, handmade wooden cars, handmade little puppies, finger puppets, etc., 710 pencils, 55 hair bows, and 23 brand new soccer balls. We also left a couple suitcases down there for missionaries to use. We donated all of our extra gloves, gauze, needles, antiseptic, sutures, etc. with the dental clinic in Guatemala City. supplies and lunch. It worked our beautifully! Greg arranged a driver for us named Elmer. Elmer was amazing! He jumped right in and helped with translating, crowd control, and rounding up more people for us. He helped load and unload and clean up at the end of the day. We all greatly appreciated having Elmer as a part of our team this year! Greg and his wife Lucia were amazing! They helped with crowd control and translating, which is a huge help! Lucia also helped by teaching our dental health class and handing out gifts. There was a bit of a mix up with the recent change in local government and another medical group that was set up nearby so Greg and a couple other local men went out and found people and brought them or sent them to us. They came by pick-up truck, taxi, tuktuk, and foot! Greg and Lucy both worked very hard to help us and it was very big success! well, and cooking classes! 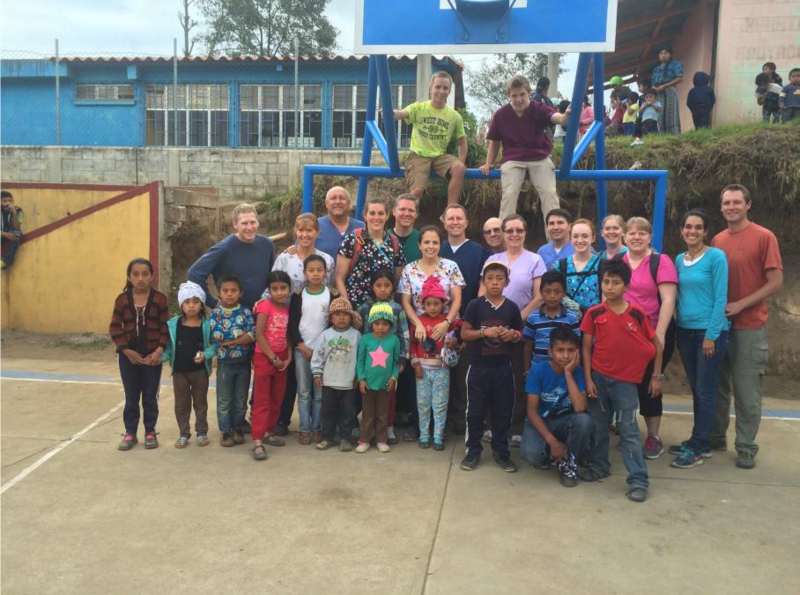 Between our dental service and our service to the families in Greg and Lucy’s program I feel our team made a wonderful difference in Guatemala this year. 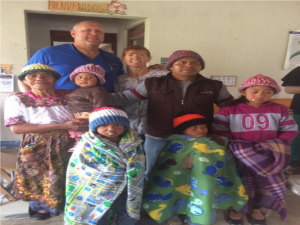 To be part of a dental team helping and serving the people of Guatemala was such a blessing in our lives. For months we have prepared humanitarian items to give away and we were amazed at the many people who donated money and items to take to Guatemala. Our hearts were full as we witnessed our son and his wife as the leaders of this group and their expertise to organize and prepare items for the trip. But nothing prepared us for the feelings of actually being a part of the group and witnessing the love of the team as the lives of the Guatemalan people were touched. Tears came to our eyes many, many times during the week. The team members worked hard and gave service unselfishly. Words cannot express the feelings of giving a blanket, a hat, or a toy to someone in need and receiving a smile or thank you in return. It was fun to choose just the right blanket or item to give an individual, oftentimes using the spirit. The dental process was a unique experience to witness. As support members we watched as triage was done on an individual, then they moved to the anesthesia station, and then on to the dentist. 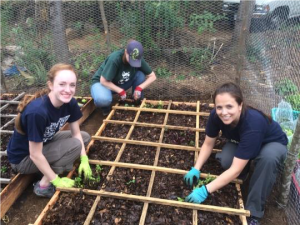 A highlight of the week was being able to go to the homes and setup the garden boxes. One lady was so willing to show us her humble home, her kitchen, and her needlework. She and her nephew were so excited to receive their garden boxes which they had earned by completing the course and to choose the garden vegetables to plant in the boxes. Because of this trip we were able to experience being part of a team of amazing, spiritual people. 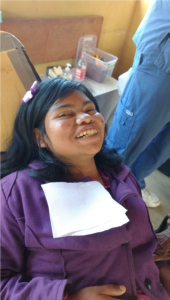 We were able to see the hand of the Lord as His Children received needed care. The people howed gratitude by their smiles or nod of a head. Thirty years ago this year I began my mission for the church of Jesus Christ of Latter Day Saints in Guatemala. So to have the opportunity to go back was a dream come true. It was an excuse and reason to return; something that I wasn’t sure would happen. When I was made aware of Nathan Tolman putting together a group to go down to Guatemala to do dentistry, I was all in. Our first day doing dentistry was a challenging one for me. After breaking a few root tips and having to go in with elevators and even a hammer and chisel to remove them, I wasn’t sure if I was really helping these people. I wondered if I was really providing a service for these humble, accepting patients. After the next two days it became more clear to me that these humble people have real teeth challenges. It is truly amazing that we all don’t have more life threatening infections. Seeing the tooth decay and the potential for these infections, it was made clear to me that we are helping these people certainly with teeth issues, but also with love, compassion and kindness. All who participate–the patient, the doctor, assistant, and supportive staff all come away from the experience edified and uplifted. It is a win win experience for everyone. I am ready to go again and this time bring others who can benefit from this giving experience. shock. The amazing thing to me was that this woman who I’m sure was in pain, just laid there while he was digging quite a bit on her tooth and using a hammer! We ended up using the hammer and chisel on three patients that day, but luckily didn’t have to get them out the rest of the week! It took me the first day to realize it, but we mostly saw women and children at these dental clinics. It made sense, because the men were out working in the fields, so I remember the men a little bit more since there were so few of them. One of the men we saw was a gentleman named Lorenzo who was 51 years old. He was a well-dressed and softspoken man. Dr. Stevenson needed to give him some additional lidocaine to numb him up, so there was some time to talk with him while we were waiting for it to take effect. This is one of the times that I really wish I had known Spanish. Dr. Stevenson was able to talk to him about his life and find out that he was a teacher, who I believe was retired. He also talked about his children and I could tell he was a man who believed in family and had true happiness in his life. He also was amazingly patient and calm as it took a long time to get his canine out! Dr. Stevenson did not want it to break so he took his time and we must have worked on that tooth for about ten minutes or so. Lorenzo was definitely a trooper! I also noticed how stoic most of the people were. If clinics in the United States were done under the same conditions, the children would not be nearly as well behaved and would also have not been as calm. These children were watching people all around them get shots and have their teeth pulled and they still sat and patiently waited their turn. Most of the children were incredibly brave. We did have two young women, though, who impressed me even more. These two, named Katalina and Brenda, we saw on Tuesday afternoon. They were 15 and 17 years old respectively. What I realized quickly with these two, was that they both had infected teeth, which meant that the lidocaine was not working as well for them. You could see in their faces that they definitely were feeling most of what we were doing. Although, I did give them each a hand to squeeze, and they took it, they still laid as still as they could and dealt with the pain. They did give me a squeeze now and again, but their bravery was amazing to me. I hope that having to go through that at least relieved their pain afterward! The final day Dr. Stevenson and I were out doing triage. This was great for me because we got to see everyone whether they needed extractions or not. Many teeth that to me looked painful and rotten, they didn’t complain about. We only pulled the teeth that were hurting them at the time. It was also interesting to see the children and how bad some of their teeth were. I hope that some of them will remember what was taught to them about dental hygiene so that their permanent teeth will look and last a lot longer than their baby teeth! Our recent travel to Guatemala was my first time in the country. I have been to Argentina as a missionary for The Church of Jesus Christ of Latter‐Day Saints over 24 years ago. During this recent opportunity to serve, I found many similarities between the people of Guatemala and Argentina. The people in rural villages were humble, kind, grateful and surprisingly cheerful and happy. Even though living circumstances were very humble by our standards, the people appeared content and happy with what they had. Tablones. I sat to rest and was immediately surrounded by children who began to ask questions about my home, job, family, mode of travel to Guatemala and the cost. My command of the Spanish language was being tested. A young boy asked, “Is everyone in the United States rich?” My response was no. I explained that some people in the United States may have more money and possessions but that money and possessions do not bring happiness. In Guatemala, I was able to see more happiness, community service, and kindness among people who had very little in comparison. Everyone appeared to be working. They all work out of necessity and because it is how they survive and take care of their families. I met a mother of 4 children whose husband was killed last year. She takes care of her family by washing clothing for others. I believe that work, humility, gratitude and compassion are needed, no matter your income, in order to find peace and happiness in this life. This opportunity to serve the people of Guatemala filled my heart with greater love for those we served and helped remind me of the importance of compassion and my responsibility to identify with the suffering of others and to have a personal drive to alleviate that suffering. I am grateful for the Hirsche organization and the Tolman family for allowing my wife and me the opportunity to participate in a great service opportunity. I am so grateful that I was able to go to Guatemala with my 17 year old daughter Sarah. I feel that it blessed my life in many ways. I love all the people in our group. We worked well together and everyone was there to serve. During our dental days I was a floater which was fun. 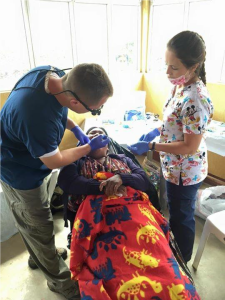 I was able to experience many different aspects of the dental and humanitarian jobs besides dentist or hygienist. I loved handing out the humanitarian supplies. We got better each day at controlling and giving the supplies out to the wonderful people there. I loved the amazing strength, courage, and faith that the people have. They trusted us to help them and were so brave. That is something I hope to develop more of – courage, strength, and bravery. One of the amazing people was a 30 something year old who had a tooth growing in his palate. The dentists debated whether or not to try to take it out without surgical tools, they decided to try. It took a lot of patience and some time, and the tooth came out. He was grateful because other dentists and the hospital wouldn’t even try. He was grateful. I was happy that my daughter, Sarah, came. She wants to be a hygienist. She was able to get a lot of great dental experience. She assisted one of the dentists over half the time. She found that she likes it and still wants to pursue becoming a hygienist. She loved serving as well. She would like to go to Guatemala again, but she is heading to college in the Fall. how and where people lived. It gave me gratitude for what I have, but more importantly I learned how amazing the Guatemalan people are. They are hard workers, resilient, kind, and determined. I am blessed to have been a part of seeing miracles. There were people who never would have received dental help if we had not gone to their village. In saying that, I know I didn’t do any of the miracles, but I’m grateful that I was part of the wonderful team that helped them happen. and over) had healthier teeth. They weren’t exposed to the high amounts of sugar that these younger kids have and consequently, still have many of their teeth. Paola was brought to us by her grandmother (16 years old?). Her mom died when she was very young. She walked with a limp and had minimal use of her left arm. Her grandmother said she suffered from seizures. I can’t remember what tooth we pulled, but she smiled the whole time and her grandmother was very grateful. We pulled 6 teeth from a gentleman named Manual. He was 60 years old. Most of them were broken at the gumline. He never flinched, never complained and also left very grateful. These Mayan people are truly a simple, yet determined community. They focus on living and surviving and they work hard everyday without complaining. Truly an inspiration to us all! Thank you so much for inviting us to be a part of this great experience. We really felt like we were jumping in blind since we have never done this before. Working with Greg and Lucy was also a big bonus. We are really glad we were able to spend a whole day with them building garden boxes and seeing the vision they have for Guatemala. We really have no complaints. The company was good, the food was good, the lodging was good. It was truly a great experience. Dan and I were both bummed to be feeling sick the last few days, but still glad we could be there. Thanks Satina. You are a great organizer. Thanks for making it all happen! First and foremost, another big Thank you for you your organization and carry out of the trip. Not knowing what I was getting myself into, and having some pre-planned ideas in my head, it was a lot diff erent (in a good way) and exceeded my expectations. As far as an experience I can share for the official record…., I reflect back on our first day of service with great emotion and a heart that could just burst. I am not sure I can get all the right words out…..
It’s one thing to finally arrive in Guatemala, talk about it and prep and then have devotionals and testimony meeting. It was all so uplifting and good, I knew we were in for a treat when it came time to actually get down to business and serve on Monday. I was most unprepared for emotions and feelings I would have. I was grateful that Los Tablones was our first area and that there were many children that just hung out the majority of the day. Watching the children was one of my favorite parts, sharing in laughing, playing, hugs and kisses. The innocence, love and humility, their happiness, appreciation and gratitude was apparent. It was the only day that I had the most interaction with them that didn’t include inflicting anesthetic pain. When it came time to leave on Monday I felt my feet dragging and delaying our exit. I could hardly bring myself to say goodbye and knowing that our work was done and I’d never see them again or make more of a difference…. All the things we talked about in testimony meeting and devotional suddenly became so tangible and real in my arms and to let that go and say goodbye made me feel “isn’t there more I can do? I realize we were just a drop in the bucket in consideration of the bigger picture. But I also know that nothing small goes unnoticed in the eyes of our Father. As we drove away, I sobbed, I didn’t know how else to feel. My heart is so grateful for the love that I was allowed to develop for my brothers and sisters, these little ones, for the friendships made even though brief, for their instant trust in me/us. I didn’t know how I could feel so many emotions at once and reflecting back on it feels like a very spiritual experience that fills my heart with great emotion and there are no words adequate to convey it. with some of the women, especially this one. To be a part of something that would change their lives and lift them, and help make them better. Even if she wasn’t a member, our spirits spoke to one another and in our embrace the only words uttered were “mi hermana” and in that moment I truly saw her as my sister and wished for more time to serve her and know her. Wow, get me started and the stories and thoughts just come to my mind…. Aside from the “fun” parts of the trip, I am most grateful for the wonderful and good friends that I got to spend a whole week with. To be in your (everyone’s) company, to openly have gospel discussion and feel safe in sharing spiritual moments, to serve, laugh, & love together was an incredible part of this trip and I will forever be grateful for that. No matter what happens in life, nobody can ever take that away from us. I am also very pleased with the way our boys conducted themselves (and Sarah) but it was such a delight to serve along with them and get to know them all better and see them in that environment doing for others. Again, thank you for everything!!! My story happened on the first dental day. feel acutely the fact that God loves that girl. Thank you for organizing the trip and planning it how you did. I’m grateful I got to go and gain the experiences I did.